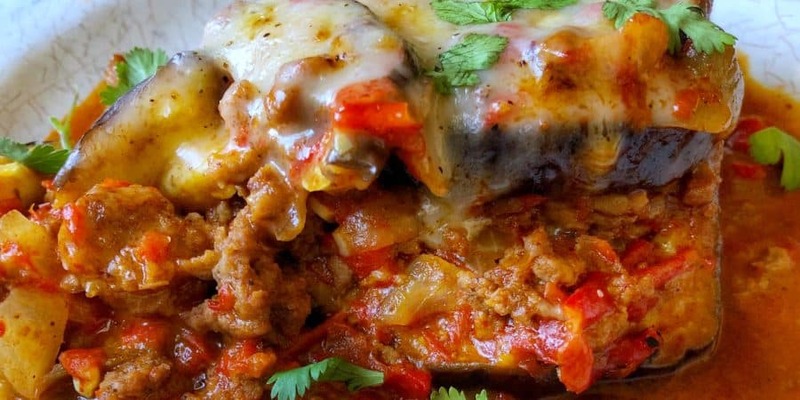 Many of us have heard of moussaka; that delicious greek baked eggplant and ground beef dish often topped with bechamal. Well, my mom made something very similar to it growing up. I was actually reminded of this rich dish the other day when speaking with my mom on the phone. She made it for dinner for my dad and brothers. The next day I went to the grocery store and bought the ingredients! Here is my version of it; although not as traditional since I used red peppers as opposed to tomatoes; it is still delicious! Rub olive oil on eggplant slices with salt and pepper then place flat on a baking sheet to bake for 20 min until tender. Set aside once cooked. Then, rub olive oil on some red bell peppers or tomatoes. Sprinkle with salt and pepper. Place on a baking sheet and broil on high for 10 min on each side of the pepper. Tomatoes will need less time to blister. Traditionally, tomatoes are used but I use red peppers because they aren’t as acidic. Process the roasted peppers or tomatoes with 4 garlic cloves until it is a puree. Salt it and set aside. In a skillet, add 1-2 tbsp olive oil. Saute onions and garlic for 2 minutes. Then, add the ground beef along with the onion powder, salt & pepper, garlic powder, and allspice. Add tomoato paste now if choosing to do so. It will add great flavor; I just shy away from tomatoes. Cook till browned. Add the prepared sauce to this and place on low heat. Let this simmer for 5 minutes. Spread some of the beef and sauce mixture on the bottom of a baking dish (8×8) in size just about. Then top with the eggplant then the beef sauce mixture then the eggplant then the beef then top with shredded cheese. Cover with aluminum foil and bake for 15 minutes. Take the cover off and broil for 2 min on high. Enjoy with a refreshing salad and some rice if you would like.